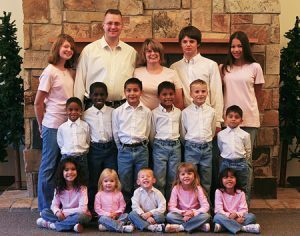 John and Cayce Thill have cared for dozens of foster Children from their surrounding Utah community, adopting 12. That same community spent five days in March saying thank you. John L. (MPA ’08) and Cayce Thill, didn’t expect their foster-care efforts to be celebrated—much less recognized by Oprah. They were just doing their part. John, who until July worked as a chef at BYU’s Aspen Grove, joined the Utah Foster Care Foundation so he could help the 2,600 foster children in Utah and spend more time with his family of 14 children, 12 of whom are adopted. “It was never our intention to have such a large family,” Cayce explains. Along with the 12 children who have officially been adopted into their family, the Thills have welcomed dozens of foster children into their Orem, Utah, home over the years, providing nurturing and stable support during times of difficulty. This dedication led the Utah Foster Care Foundation to nominate the Thills for Oprah’s Big Give, a prime-time reality series that focuses on supporting deserving people. Oprah’s Big Give initially gave $10,000 to fulfill the Thill family’s wish for a new dining room and table, one that could accommodate the whole family. However, ABC 4 News and the Heart 2 Home foundation quickly expanded that donation into a community effort valued at $200,000. While the Thills were away for five days, volunteers came to their home from the surrounding community—some staying for two to three hours, some staying for two to three days—and completely remodeled the home and landscaped the yard to meet the needs of the family. This experience provides support for John and Cayce’s belief that the world is full of wonderful people. And in a world of wonderful people, the Thills are just trying to do their part.